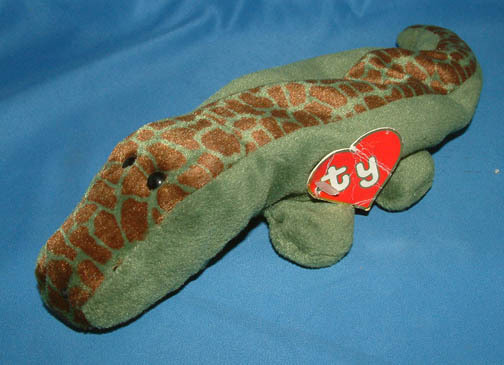 Very few Ally the Alligator Beanie Babies are worth money. Versions with a 1st generation hang tag and tush tag can command decent money. Ally’s with a 2nd generation hang tag and a 1st generation tush tag can still bring in some money, but typically less than $100. 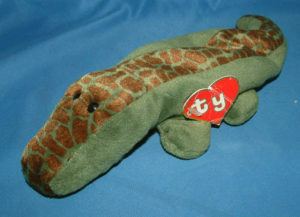 Many Ally Beanie Babies were made over many years and very few will have the 1st gen tags. Some of the 4th and 5th generation Ally Beanie Babies can be found for less than $5. Now if you have a 1st generation Ally, then you might be able to get over $100 for it. It just all depends on current market conditions and it might be wise to get it authenticated to maximize your value. Check what a 1st generation hang tag is here and what a 1st generation tush tag is here. Ally’s that have both 1st gen tags can be worth over $100. You can reference what other 1st generation Beanie exist is on this site. Notes: On the inside of the tag the “To” and “From” was written out which can impact the value a little bit. Notes: Seller said they were the original owner of the beanie baby. The hang tag had a slight rip on the back side, probably from peeling off a price label. Notes: the seller is a well known eBay dealer of Beanie Babies. The hang tag was well mangled, which greatly impacted the price. A little rip here and there won’t impact the price that much, but this tag looked like it went through the washing machine. Notes: if your Ally doesn’t have a 1st gen or 2nd gen hang tag this is the kind of price you’ll get…. but usually less.